Ruby - Im so innocent!! 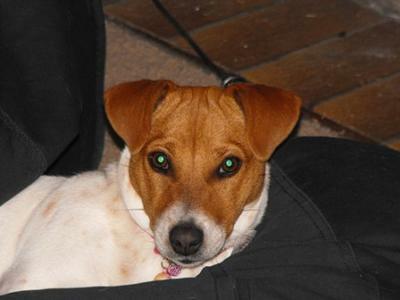 How can I get my JRT to come when called and not run down the road away from me, Im worried for her safety. She is 6 months old and Im at my wits end on what to do. She sits stays drops and shakes my hand but wont come when called. Help!!!! Comments for Coming when called. Never let your JR lose - they may come back for yr's then all of a sudden they may never come back again--when they get something in their sight they have a one track mind--and its not you!! They can climb a 6ft chain link fence or dig under anything especialy when bored!! A trolley line is the best with a harness a JR's trachea is very sensitive and can easily be damaged by collars on leashes ect... never jerk your JR by the collar or let them do it. My Jack is 3+ yrs and he is impossible about recall! I have trained him with the leash and treats. He comes in the house, on the leash, but not if he escapes, no matter what I have in hand! A fenced play area or a trolley line for play time are a must. I run toward the golf course and driving range, away from the road and I cry a lot when he gets away! (which is not often, for sure). Good luck! Mine did not run away so young as yours! You need to walk the Jack every day for a good long time! get a fence !!!!! take your dog to obedience classes. get a fence. I won't sell a dog to anyone without a fenced area. they will go no matter what. get a fence. get a fence. save your dog life. get a fence. My 2yr old male JRT does the samething - he is areal escape artist and then feels it is a game for me to chase him while he runs down the road. I have learned to keep a few treats and a small squeeky toy in my pocket for such incidents - so far they seem to be working - good luck and she is soooo cute.